Goodbye Lanzarote. I’m sat on a plane, somewhere over the Atlantic, on my way home and as the camps are still fresh in my mind it seems a good time to reflect on lessons learned over the fortnight. As ever it was an enjoyable and rewarding experience and I’ve come away with fresh ideas and motivation. I haven’t taken the time to uncluttered these thoughts and I’m enjoying my second small bottle of in-flight red wine, so I’ll resort to the rarely used form of a bullet point list. Firstly, there was never any doubt, but there is no substitute for coaching your athletes in person. You can see how they swim, they bike, they run; how they respond to the training and what gets more out of them. 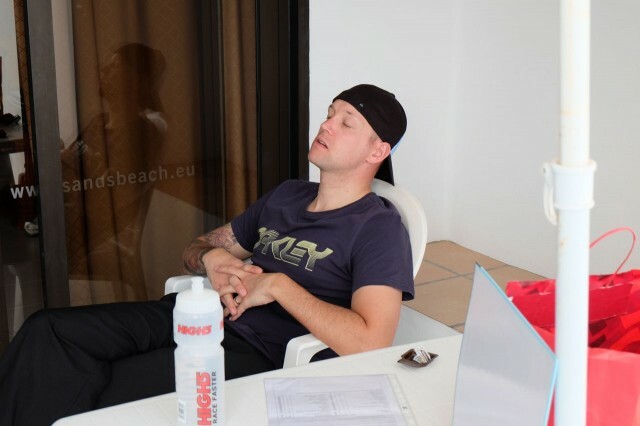 TrainingPeaks, emails, phone calls, Skype have their role, but just a single week with an athlete tells a coach a lot. To reassure those on camp, you have nothing to worry about. For the most part. As diverse as the abilities of the athletes were the mentalities. Some get on and work without complaint; some need the edge of competition to assist them; some spend too much time comparing themselves with others; some underestimate their capabilities; some need reining in. It affects how they train and often how they should train. Again, more easily picked up in person. Coaching styles differ too and Mark and I have differing, but mutually compatible styles. It’s almost like Good Coach, Bad Coach (not in terms of our abilities) based on the athletes’ reactions. Mark definitely is the brunt of more abuse than I am! You can add volume to bike and run without a complaint, but give an age group triathlete more swim and they aren’t happy. We cut volume on last year to allow more feedback and quality in sessions, but still our long ’birthday’ swim sets were initially poorly received. On that point though, if you break 5km down and keep encouraging it’s not that big a deal. I don’t think I’ve got the camp run training right yet. The bike volume is high, so is the swim volume, legs are tired – it’s difficult to really work the run effectively and there doesn’t feel like there’s room. We start with a race and then largely let athletes manage short volume runs over the week. Next year I want to address this and improve the work we do here. 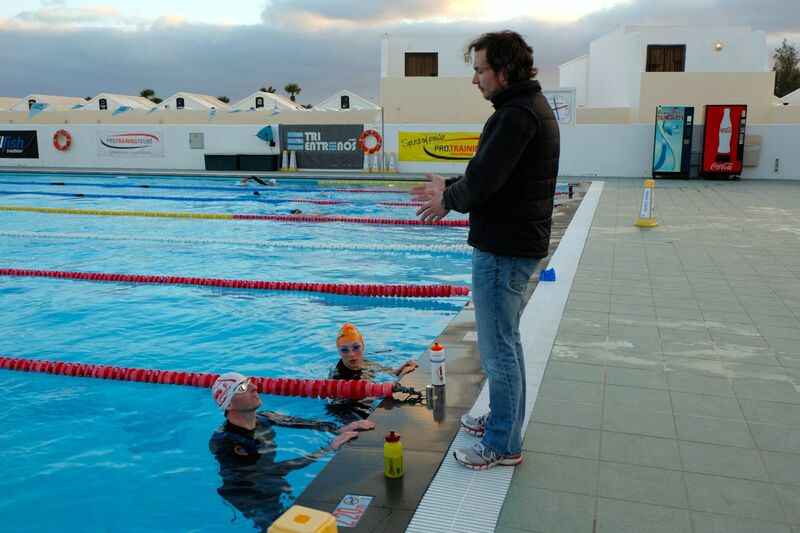 Our swim sessions on the other hand are a high point of the camp and we push our athletes both in terms of technique and fitness. My only thought here is that it always surprises me how many of the athletes find these sets more challenging than their own club sessions. All we do is give continual feedback, timings, set offs, encouragement and make sure they work to target paces. We do pull out swimmers early when it’s clear they can’t give us anything good and we do keep pushing them when it’s clear they’re being lazy. We is mostly Mark, but this year he did keep the volume down a little! The team relay format is perfect for an easy day on camp and a lot of fun too. My only question would be – did we go too easy? Overall the week is big and I think having a truly light day benefitted most; with athletes hitting 20-30 hour weeks it’s probably right. We – the coaches that is – can do less. This year we hired a car for the long ride days and rather than having coaches out riding with athletes, we used that car to support. I’ll admit I was nervous about hiring a vehicle, triathletes have a tendency to expect their coaches to also train, but I’m not racing, I don’t train as I used to, and I’d be concerned if I could keep up with my best athletes. 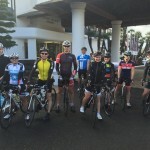 I’m not looking to completely eliminate time spent riding with the group, but certainly to continue to manage this so athletes are well supported without being slowed down by their comparatively out-of-shape coach. The collective noun for triathletes should be herd. 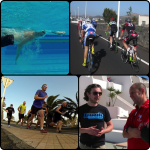 Running and coaching a camp I herd triathletes from session to session as efficiently as I can. Some are easier than others. Finally, 2 weeks is enough. Both Mark and I agree: we couldn’t handle any more. The time away from home and family and the stresses on our bodies was as much as we could take. There will be more camps next year, but no more than 2 weeks in one go. Given time, and there is 90 minutes left of this flight, I could probably come up with more, but I’ll close with a few thanks. Firstly to Mark Racher for ably assisting me yet again, the camps may be run under my name, but they wouldn’t work without him. 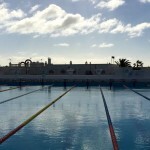 To Sands Beach Resort for the training, and perhaps more importantly, recovery environment – athlete feedback has been positive again. Last, but not least, to all the athletes (with an extra mention for Frankie for coming for 2 weeks) – thanks for coming, joining in and not making my life too difficult (even you Steve)! Time to recover, then to plan. We’ll be back for more, 2015 dates will be announced later in the year.